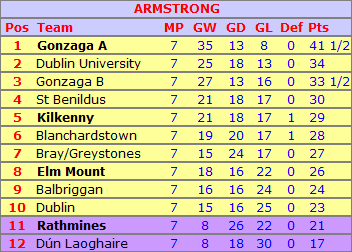 Starting at the top, and the Armstrong racked up a third win in a row to storm up to fourth in the league, our early bad start to the season now either forgotten or regretted, depending on what way you look at it! Dún Laoghaire were the victims this time, on the big scoreline of 6½-1½. Stephen had a passed pawn in a double rook endgame and won; Tim continued his excellent from from Gonzaga and his pieces dominated against Séamus Duffy, who hadn’t been able to castle, and soon lost a queen for rook and bishop with no let-up of the pressure. Zdravko‘s opponent’s phone went off, so he won to move to 5/7, while John snatched a risky pawn, but his opponent later blundered and lost a full exchange. Brendan crashed through his opponent’s king in typical Brendan fashion, while late sub Ben was a passed pawn up from relatively early on and eventually found a way to make it tell. Gerry was held on 2 – his second low-1800 draw in a row – while Ciarán’s form continued with the only defeat of the match; he’s on ½/5 for the season. While it’s tempting to now look up the table and target second place, the reality is we’re the only ones of the top eight who have yet to play Gonzaga A, and so we may well finish lower than we are at present. Though at least honour has been restored! Elm Mount are next up, next week. 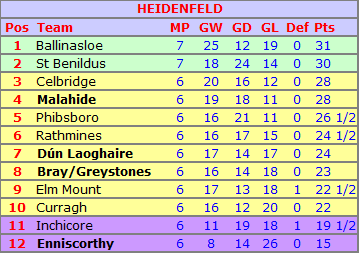 The Heidenfeld were joint third with two other teams after round 6, and we played one of those – Ballinasloe – last Saturday in Athlone. Ballinasloe can be a different team depending on whether you play them at home or away, and against us they brought out two new players, including a 2100 on board 1. We were missing our own board 1 due to a clash with some rugby game, and were once again very much up against it. Our rampant Ennis team (more later!) picked up 1½/3 on the bottom boards, and for a while, the other five boards were looking quite decent. Then we went badly wrong on two of the boards. Michael had his opponent completely pinned back, but wasn’t able to find a way through; his opponent was about to offer a draw, but Michael sacced a piece instead, missing a zwischenschach which meant the piece was lost, and the game went with it. Meanwhile, I had been gifted a +6 position against an 1850 who was trying out a new line of the French; I could cash in with an immediate sac, or ratchet up the pressure and hope my opponent didn’t have any good defensive moves. Alas, not being able to see much wrong with the sac, I went for it, and of course almost immediately noticed that I’d also missed a zwichenschach which left me with three pawns for a piece, but those pawns were awful, and my position went quickly downhill. There was also a missed zwischenschach on 3, but fortunately it was Vjeko’s opponent who missed this one, and Vjeko won a piece, which became a whole rook. Brendan’s opponent played an unusual sac line in the French, which meant Brendan was half an hour down early on, but was a pawn up and had two bishops for two knights. In a topsy-turvy game, Brendan won a piece, then lost it back again, then lost another one to stop his opponent queening, and ended up with three pawns for a knight – and nothing else. His opponent offered a draw here, which Brendan of course declined, being unable to lose the position, and even though he had at one stage 25 seconds to his opponent’s 25 minutes, his pawns were coordinated enough that he was able to promote and reach a QvN ending. These can actually be tricky enough if you’re not used to them, but fortunately for us, his opponent hung the knight to a skewer on the next move. Dylan dropped a pawn against Rory Quinn on 1 and grovelled for a couple of hours, but ultimately was ground out of it in the deciding game, and Ballinasloe had a 4½-3½ victory. 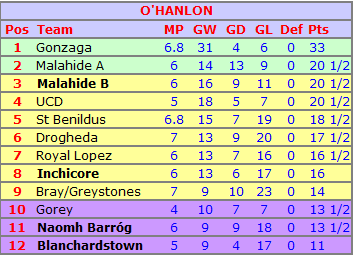 But we’re still very much in the promotion hunt; Ballinasloe still have to play Celbridge, while we’re still on course for a possible winner-takes-all final day tie against Malahide. For now though, Bray at home is next up. My board prize hopes are effectively over after 1 point from the last 3 rounds; Brendan is now the team’s top scorer after three 1680 wins in a row. 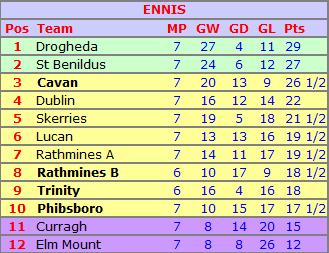 The Ennis had a big game against unbeaten Dublin, second in the league going into their match. They knew that Dublin’s titled played had just subbed permanently up to the Armstrong, but they could hardly have expected everything on the night to fall into place as neatly as it did! Slavko got in a sac on f7 very early on, which very quickly translated into a piece and two pawns, which was game over. Odhrán’s opponent’s phone went off – he challenged Odhrán’s claim of the game on the grounds that his phone only vibrated, but of course that’s more than enough – while Kavin also won. And the wins kept coming – Lara added another to go to 6½/7, all as black, Leon was a couple of pawns up on 1 and won, while William did the donkey work on 6 and ground out another win to see the team take a 6-0 win. Whitewashes don’t come around all that often – certainly outside the bottom leagues – and this is our first whitewash win above the BEA since this website began back in 2012! In that time, we’ve had 2 whitewashes in the BEA (both from our B team this year), 5 in the Bodley (one against ourselves, which was one of three 5-0s in the same season from our ridiculously good 2014/15 team), and 3 in the O’Sullivan. Going back before that, our 2011/12 BEA team started with two 5-0 wins in a row, while our record-breaking 2009/10 Ennis team picked up two 6-0 wins. So this win is not to be underestimated at all! Better was to follow for them at the weekend with the news that Drogheda – missing five players – had surprisingly lost at home to relegation-threatened Curragh. This now really puts the cat among the pigeons! Cavan won 5½-½ in the same round, and it’s now the three of us who are clear at the top, and of course we have to play Cavan in the final round. For now though, Rathmines B are next up, and having beaten their As 4-2, we’ll be hopeful of putting a few more points on the board to keep the pressure up on the Drogs. The O’Hanlon also had a whitewash, although not quite of the same kind! Gonzaga were the visitors in the room next to the Ennis, and this one ended with a 5-0 defeat, with one game still to come. Zhengjun faced a rare line of the seven-pawns attack against the Alekhine, which was every bit as terrifying as it sounds, while Desmond was unluckiest of the lot, being just a pawn up when picking up the wrong piece and, worse, then realising it had no squares to go to. So onwards to the next game, which is away against Malahide B, who won their last game 5-1, so there can be no over-confidence about playing a B team! Ronan is the player whose Gonzaga match has been rescheduled, and so he is still unbeaten on 4½/5. The BEAs have both slipped up in recent weeks. The BEA A had a nightmare of a time getting a team out for a trip to Kilkenny; Ben‘s win against a 1900 (provisional) meant we at least picked up something from the trip, and mean he’s now on 3½/4. Games are going to start coming thick and fast for the As, who are way behind our other teams in terms of games played – and indeed, they have just five days between that match and their next, which is tomorrow at home against Bray. 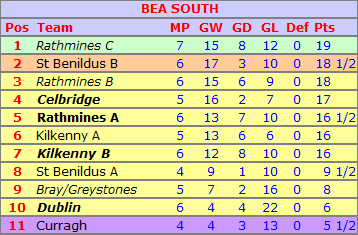 The BEA B, meanwhile, started the year joint-top with Rathmines B but with a match in hand – and their first match after the break was against Rathmines B! This was a golden opportunity to break clear at the top, but unfortunately things didn’t go to plan as we went down 3½-1½. Eric lost his 100% record with a draw, while Thomas lost to St Benildus pupil Gagik. Zhengjun got the only win of the night – and then added another Rathmines win last night as the side drew 2½-2½ against Rathmines C, the games against Rathmines teams coming like games against Soviets in a proper candidates tournament! With Eric unavailable due to holidays, this meant that Zhengjun takes over as top scorer on 5/6. Thomas also got a win on the top board, but Rathmines rallied on the other boards and came away with a share of the spoils. Still, the Bs are still very much in the hunt. It’s now Rathmines C who are slightly ahead but with a match more played, while Rathmines B now have the same number of games played but are a half point behind, and Celbridge and Kilkenny A have matches in hand, which could be vital. The As play Bray tomorrow as noted, while the Bs play Kilkenny B. This one could go down to the wire! Finally to the Bodleys. 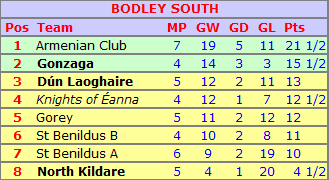 The Bodley B were the only one of our teams not to play recently – they play Dún Laoghaire tomorrow; Ryan remains top scorer on 2½/3 – while the Bodley A were in Dundrum to play the Armenians. Joe and Robbie picked up our only points – a win and a draw – which means Joe is the top scorer on 3/6. Their last game of the season is in a fortnight’s time against Knights of Éanna.